Connecting a Dell Studio Slim to a Dell ST2210 21.5" monitor. 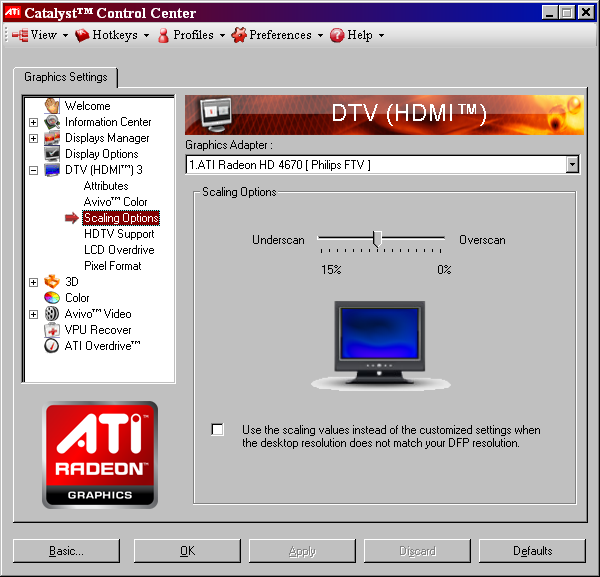 The PC has a ATI Radeon HD 4350 video card. The video card has DVI and HDMI connections. When I connect with the DVI everything works fine. When I connect with the HMDI the image doesn't fill the screen, i.e. there's a approx 1 inch black border around the image. Win7 tells me the res is 1920x1080 (the native res of the monitor). Tried rebooting, no luck. I get the same when outputting to my TV on a Nvidia based laptop. Take a look in the ATI settings, you want to find a setting that deals with Overscan / image size. I had exactly the same issue with my HD3200 based HTPC setup. When using HDMI the ATI driver defaults to a 15% Underscan. If you are using the newer (9.6 or later) version of Catalyst then ATI helpfully hid the Overscan options. When you are looking at the monitor selection section of CCC you need to right click on the small monitor icon at the bottom and select configure, not the big one at the top. You'll then be able to see the screen posted above. I'm at work at the moment so can't show you pics but will screengrab tonight for you if you still need it. I think it is rather an "overscan" or "just scan" setting on the TV resp. monitor than on the graphics card. Maybe you should also look here. Not the answer you're looking for? Browse other questions tagged display hdmi or ask your own question. How do I enable/disable overscan on my TV in Catalyst Control Center?